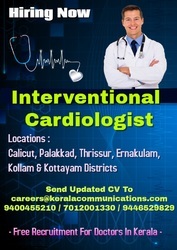 Hiring Radiologist for a hospital in Muvattupuzha Ernakulam district of Kerala. Qualification: MD/DNB in Radiodiagnosis with minimum 3 years of experience. Salary commensurate with qualification and experience. Free accommodation.